Here's a fascinating game that we got to meet while at PAX. My first opinions at a glance was that the unusual take on the surroundings of the character, it seemed rather surreal, dark, and yet very organic as opposed to the typical rainy night of most games nowadays. Thankfully, we had the opportunity to speak with Guillame Provost, the studio head of Compulsion Games, about Contrast to find out more. First of all, the games mechanics were heavily based on Portal considering that they wanted the mechanic to deal with space within the game in a unique way. In this case, using the shadows, the main character can utilize the shadows of other objects in the area to progress by using them as 2-dimensional platforms as her own shadow, while also coming out of the shadows to use 3-dimensional platforms. 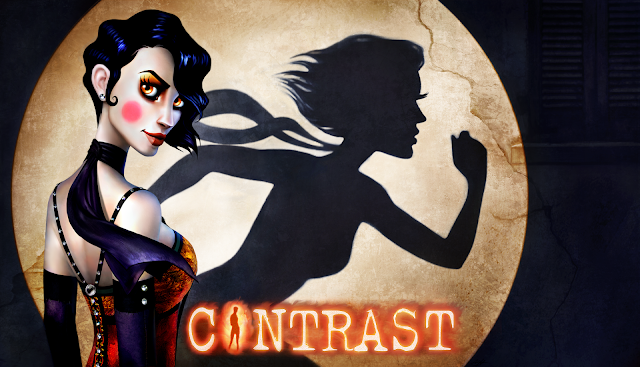 This works out very nicely since Contrast steadily goes from pure platformer to platform/puzzler. Guillame's take on the story base really fascinated me. The main playable character is actually the main character's imaginary friend. Rather than have the girl get rescued by a prince from her family troubles and whisked to a faraway land or something of the like, she instead has an imaginary friend who helps her through the family trouble by progressing through the game. So, in a sense, she's rescuing herself. Girl power! 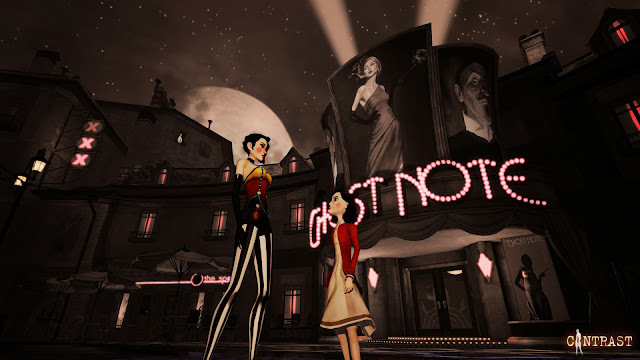 The other interesting item of note, the surroundings again, are heavily based on several different locations in Europe all within a film noir setting which lends itself beautifully to the shadow jumping mechanic. Keeping to the noir theme, Contrast's jazz score fills out the atmosphere of the game very well. It strikes the perfect balance of playful and dangerous and adds a lot to the environment of the game. I'm extremely excited for Contrast's release come November 15, 2013, I really wished that I had more time to play, and had a blast with what I did get to check out. Definitely a game that would be a tragedy not to experience, pick it up!